The District of Columbia allows students to earn dual credit through dual enrollment courses taken at an institution of higher education. Public postsecondary institutions are not required to accept these credits (Education Commission of the States, 2015). The National Council of La Raza and Woodrow Wilson National Fellowship Foundation have partnered with institutions of higher education to each provide one Early College High School program as part of the Early College High School Initiative (ECHSI). More information about schools participating in ECHSI is available at the ECHSI website (Jobs for the Future, n.d.a). More information about the University Park Campus School is available at the Jobs for the Future website (Jobs for the Future, n.d.b). For more information about programs of study in the District of Columbia, visit the District of Columbia Public Schools website. In 2009, the District of Columbia mandated that all students in Grades 6–12 have an Individual Graduation Portfolio (IGP) (U.S. Department of Labor, 2013). The IGP is accessible online through the District of Columbia Public Schools Web portal. The online tool provides students with a planning map, customized by grade level that outlines what students are required to complete by the end of each grade. Ongoing monitoring and an annual review process are required (District of Columbia Public Schools, 2011). 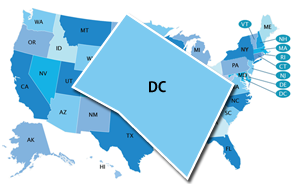 The District of Columbia website cites Student Support Teams as responsible for establishing Early Warning Systems and providing appropriate interventions. The level at which Early Warning System data are reported and who can access the data is not publicly available.